BURBANK, CALIF.–MARCH 30, 2015–Nickelodeon has named Jennifer Dodge to the newly created position of Senior Vice President, West Coast Development and Production, Nickelodeon Preschool. In this role, she will spearhead West Coast-based development of all original content for Nickelodeon Preschool's programming block and the Nick Jr. channel, as well as additional preschool platforms such as the Nick Jr. app. The announcement was made today by Russell Hicks, President, Production and Development, Nickelodeon, to whom she will report. Dodge, who will be based in Nickelodeon's Animation Studio in Burbank, Calif., will take pitches and develop creative assignments for preschool projects. She will also be tasked with developing in-house talent, and discovering and nurturing new artists and writers in the West Coast creative community. Prior to joining Nickelodeon, Dodge served as Vice President and Executive Producer for Spin Master Entertainment, the company's film and television subsidiary. In this role, she was responsible for all content and strategy related to the Entertainment Division of Spin Master Ltd., including the creation, acquisition, development, financing, production and distribution of television series, feature films and web content based on currently owned and newly created intellectual properties. Having joined Spin Master in 2009, Dodge was the driving force in greenlighting more than 200 episodes of animation, including the launch of boys' action properties RedaKai and Tenkai Knights. Dodge also led Spin Master's foray into preschool with the hit PAW Patrol, which airs on Nickelodeon. Dodge is also the co-creator and executive producer of the recently launched preschool show Little Charmers, a co-production with Nelvana, for Treehouse in Canada and Nick Jr. worldwide. Before joining Spin Master, Dodge served as VP Distribution and Sales Operations for Cookie Jar Entertainment (now part of DHX Media) and as Director, Production and Development for Decode Entertainment (DHX Media). The National Academy of Television Arts & Sciences (NATAS) has announced the fantastic Nickelodeon News that Nickelodeon, one of the world's leading recognized entertainment brands for kids and families, has been nominated for 18 awards in the 2015 Daytime Emmy Awards, the 42nd Annual Daytime Emmy Awards! Congratulation's and good luck to Nickelodeon and all the staff of the excellent Nickelodeon shows nominated for 2015 Daytime Emmy Awards! New York – March 31st, 2015 – The National Academy of Television Arts & Sciences (NATAS) today announced the nominees for the 42nd Annual Daytime Emmy® Awards. The awards ceremony will be televised live on Pop at 8:00 p.m. EDT/5:00 p.m. PDT from the Warner Bros. Studios in Burbank, CA. "This year's Daytime Emmy Awards is shaping up to be one of our most memorable events in our forty-two year history," said Bob Mauro, President, NATAS. "With a record number of entries this year, some 350 nominees, the glamour of the historic Warner Bros. Studios lot and the live broadcast on the new Pop network, this year promises to have more 'red carpet' then at any other time in our storied-past!" "This year's Daytime Emmy Awards promises a cornucopia of thrills and surprises," said David Michaels, Senior Vice President, Daytime. "The broadcast on Pop at the iconic Warner Bros. Studios honoring not only the best in daytime television but the incomparable, indefatigable, Betty White, will be an event like nothing we've ever done before. Add Alex Trebek and Florence Henderson as our hosts for The Daytime Creative Arts Emmy Awards at the Universal Hilton with Producer/Director Michael Gargiulo as our crafts lifetime achievement honoree and it will be two galas the community will remember for a long time!" Jason Kolowski, Production Designer, Michael Granberry, Animator, Drew Hodges, Character Designer and Robyn Yannoukos, Lead Painter all winning for "Tumble Leaf," Amazon Instant Video. Jairo Lizarazu, Location Designer for "Disney Jake and the Never Land Pirates," Disney Junior. Mårten Jönmark, Storyboard Artist for "Peter Rabbit," Nickelodeon. FX Group, Inc., is the official provider of the Daytime Emmy Award Almanac, the official program for the event. Yangaroo, Inc. is the official provider of the Digital Media Distribution System Awards Management Solution ("DMDS") for the submission, judging and voting of all programs in the 42nd Annual Daytime Emmy Awards. Off the Wall Productions is the official provider of the Official Emmy Gift Lounge and Gift Bag. Fans don't sit at the outskirts of pop culture making snarky comments. They live right smack in the middle of it, sharing, creating, and connecting their passions with others. At Pop, fans finally have a destination that celebrates the fun of being a fan. Fans aren't even fans anymore — they're gladiators, tributes, human beings and blockheads. Seen in more than 80 million homes, Pop gives fans a dedicated channel that loves being a fan as much as they do. A channel that respects talent over celebrity. A channel filled with optimism, passion, humor, and excitement. A channel that understands the fun doesn't stop when the credits roll... it's really just the beginning. Warner Bros. Entertainment Inc. is a global leader in all forms of entertainment and their related businesses across all current and emerging media and platforms. A Time Warner Company, the fully integrated, broad-based Studio is home to one of the most successful collections of brands in the world and stands at the forefront of every aspect of the entertainment industry from feature film, television and home entertainment production and worldwide distribution to DVD and Blu-ray, digital distribution, animation, comic books, video games, product and brand licensing, and broadcasting. Warner Bros. Entertainment is headquartered at the Warner Bros. Studios lot, 142 acres in Burbank, California, which is considered one of the foremost motion picture and television production and post-production facilities in the world and home to 35 soundstages (including one of the world's tallest stages, which has an in-ground tank capable of holding more than two million gallons of water). One little piggy will be going on her biggest adventure yet this April on Nick Jr. UK! 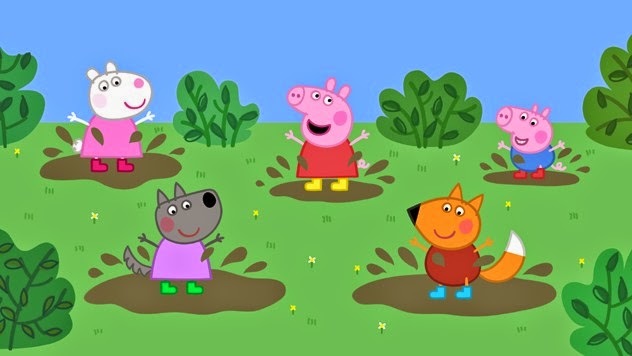 Nick Jr. UK has announced the exciting news in their new promo/trailer that Nickelodeon UK's popular preschool channel, Nick Jr. UK and Ireland, will premiere and show "Peppa Pig: The Golden Boots", Peppa Pig's first ever 15 minute special episode, in April 2015! Oink! In the brand-new triple episode of "Peppa Pig", Peppa has lost her boots, and she'll need to travel over land, sea and air to find her Golden Boots in time for the big Puddle Jump Competition! 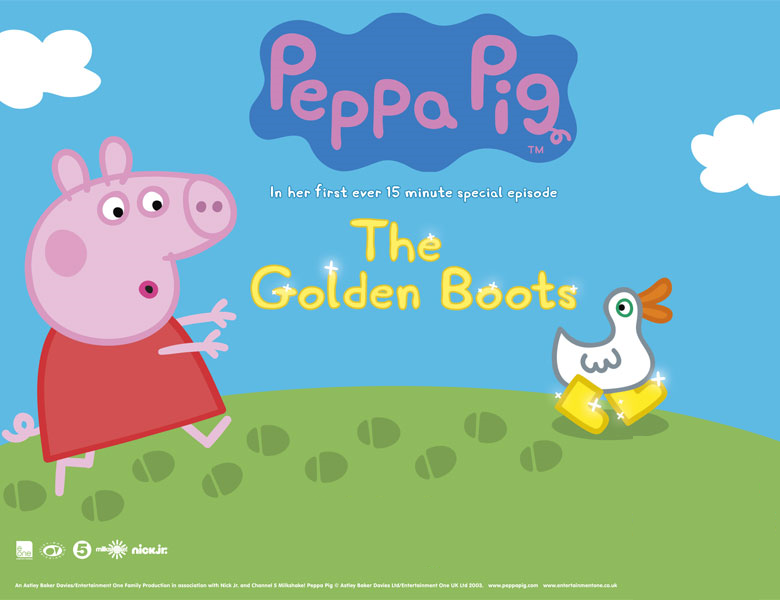 The online British and Irish TV guide website Digiguide is reporting that Nick Jr. UK and Ireland will premiere "Peppa Pig and The Golden Boots" on Friday 10th April 2015 at 5:15pm (replayed at 6:15pm on Nick Jr.+1)! Following the movie specials debut, Nick Jr. Too will encore "Peppa Pig - The Golden Boots" on Saturday 11th April 2015 at 10:00am and 5:30pm and on Sunday 12th April 2015 at 8:30am. The online British and Irish TV guide website Digiguide is reporting the very exciting Nick UK news that Nickelodeon UK and Ireland and Nickelodeon HD UK, the number one commercial kids TV network in the UK, will start to premiere and show Nickelodeon's brand-new original comedy series "Bella and the Bulldogs", in which a head cheerleader's life takes an unexpected twist when her rifle-like throwing arm takes her from the sidelines to becoming her middle school's starting quarterback, weekdays at 6:00pm from Monday 27th April 2015! Shabooya! Following the episodes debut, Nick UK & Eire/HD will encore each brand-new episode the same evening at 7:30pm. In Nick's new comedy ripped right out of the headlines of girls playing traditionally "boy" sports, Bella Dawson, a confident, caring and talented teenager, suddenly finds herself fulfilling a lifelong dream of becoming the star quarterback of her middle school football team but also having to navigate the world of her teammates Troy, Sawyer and Newt, without losing her two best friends, Pepper and Sophie from the cheer squad. 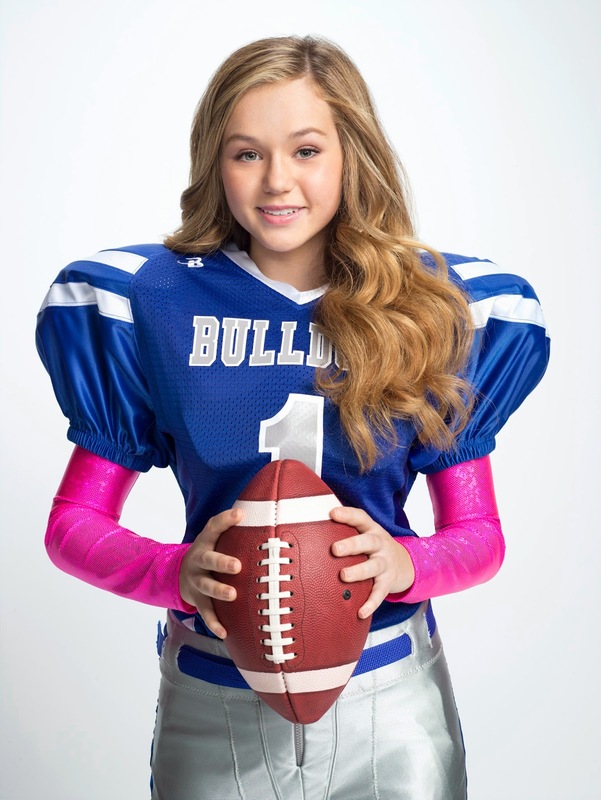 Nick UK's official "Bella and the Bulldogs" webpage features information about the series and each of the characters in the show - Bella Dawson (Brec Bassinger), Troy Dixon (Coy Stewart), Sawyer Higgins (Jackie Radinsky), Newt (Buddy Handleson), Pepper (Haley Tju) and Sophie (Lilimar Hernandez), Ace McFumbles (Rio Mangini), Carrie Dawson (Annie Tedesco) and Coach Russell (Dorien Wilson) - plus exclusives videos featuring a special sneak peek and a guide on how to speak Bulldog, fantastic photo galleries, including a 'All About Brec' photo gallery introducing Nickelodeon star Brec Bassinger and a picture gallery featuring a tour of the studio set, a exclusive "Which Bulldog are you?" quiz, and a fan poll asking what would you do first if you just made quarterback! Nickelodeon International's "Nickelodeon 2015 Kids' Choice Awards" winners are in! To help make Nickelodeon's 28th Annual Kids' Choice Awards the most global and successful "Kids' Choice Awards" ever, many international Nickelodeon channels and networks announced their localized country specific voting categories and nominations, which allowed Nickelodeon viewers around the world (Planet Orange) to cast their votes for local celebrities, as well as for Nickelodeon's global 2015 Kids' Choice Awards nominees. This year, NickHeads cast a record breaking 500 million votes for their KCA favorites globally! Voting for the 2015 KCAs spanned six continents across 19 localised voting sites, in addition to Twitter hashtag voting (#KCA), giving kids practically everywhere the chance to decide who takes home a coveted orange blimp award. 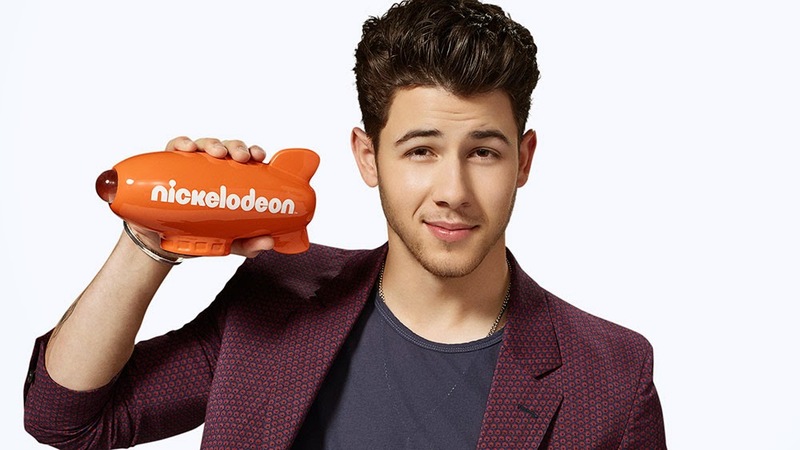 You can find a full list of local "Nickelodeon Kids' Choice Awards 2015" winners who won Nick's coveted orange blimps below. You can also find a full list of Nick's global KCA 2015 winners here on NickALive! Watch: Wednesday 1st April 2015 at 16:00 CAT. Watch: Tuesday 31st March 2015 at 7:30pm on Nickelodeon Mexico and Nickelodeon Colombia and at 8:00pm on Nickelodeon Argentina and Nickelodeon Venezuela. Watch: Monday 30th March 2015 at 10:00am on Nickelodeon Thailand (TH) and Nickelodeon Indonesia (WIB), 11:00am on Nickelodeon Hong Kong (HK), Nickelodeon Malaysia (MY) and Nickelodeon Singapore (SG), and 6:00pm on Nickelodeon Philippines (PH). Watch: Tuesday 31st March 2015 at 6:00pm. Watch: Wednesday 1st April 2015 at 20:10. Watch: Wednesday 1st April 2015 at 18h05 on Nickelodeon ‎4Teen‬ and at 19:15 on Nickelodeon. Watch: Wednesday 1st April 2015 at 8:00pm. Watch: Wednesday 1st April 2015 at 19:10. The KCA's are sadly over for another year. Roll on Kids' Choice Sports 2015 and the Nickelodeon 2016 Kids' Choice Awards (Nickelodeon's 29th Annual Kids' Choice Awards)! Nickelodeon South East Asia has announced the exciting Nickelodeon International News in a post on their official Facebook profile page, Facebook.com/nickasia, that Nick SEA will start to premiere the show "Get Blake! ", a brand-new exciting cartoon style comedy series filled with visual gags and delirious characters, on Monday 30th March 2015 at 11:25am on Nickelodeon Indonesia (WIB), 7:30pm on Nickelodeon Philippines (PH), and at 12:25pm on Nickelodeon Singapore (SG) and Nickelodeon Malaysia (MY)! Additionally, to celebrate Nickelodeon South East Asia starting to premiere and show Nickelodeon's newest live-action comedy series "Bella and the Bulldogs" in April 2015, Nick SEA will also be airing a special sneak peek preview of Nick's all-new sitcom on Monday 30th March 2015! "Bella and the Bulldogs" premieres on Nickelodeon Asia on Monday, 6 April at 5.15pm (HK/SG) and 5.30pm (PH), and Saturday, 11 April at 3.55pm (TH/WIB) and 4.55pm (MY)! Follow NickALive! on Twitter, Tumblr, Google+, via RSS, on Instagram, and/or Facebook for the latest Nickelodeon Asia, Get Blake! and Bella and the Bulldogs News and Highlights! Nickelodeon UK, the number one commercial kids TV network in the UK, announced today during a very special sneak-peek preview that Nickelodeon UK and Ireland and Nickelodeon HD UK will start to premiere and show Nickelodeon's brand-new original comedy series "Bella and the Bulldogs" in April 2015! Nick UK's official "Bella and the Bulldogs" webpage features information about the series and each of the characters in the show - Bella Dawson (Brec Bassinger), Troy Dixon (Coy Stewart), Sawyer Higgins (Jackie Radinsky), Newt (Buddy Handleson), Pepper (Haley Tju) and Sophie (Lilimar Hernandez), Ace McFumbles (Rio Mangini), Carrie Dawson (Annie Tedesco) and Coach Russell (Dorien Wilson) - plus fantastic photo galleries, including a 'All About Brec' photo gallery introducing Nickelodeon star Brec Bassinger and a picture gallery featuring a tour of the studio set, a exclusive "Which Bulldog are you?" quiz, and a fan poll asking what would you do first if you just made quarterback! 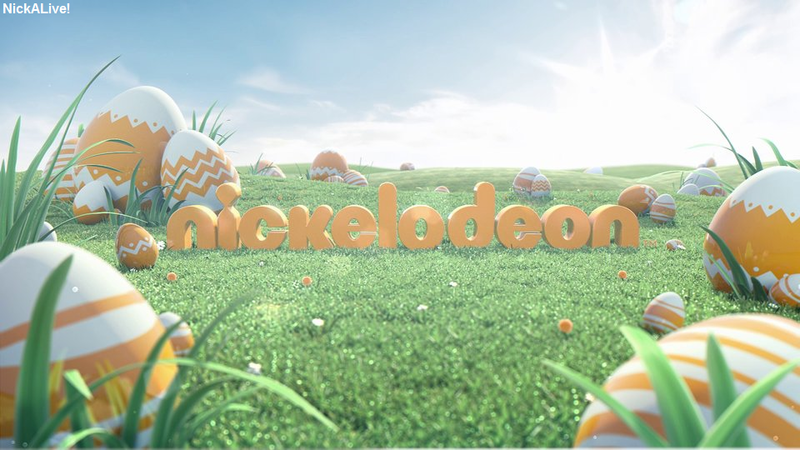 Nickelodeon UK, the number one commercial kids TV network in the UK, have announced Nick UK and NickToons UK's eggciting programming plans to celebrate the British and Irish Easter 2015 school holidays! For three whole weeks from Monday 30th March to Sunday 19th April 2015, Nick UK and NickToons will be showing a eggscellent selection of Easter goodies! There ain't no party like a Nickelodeon House Party! This Easter, Nickelodeon's craziest families invite you to the ultimate Nick House Party! Come on over to "Nick's House Party" and raise the roof with episodes of "The Haunted Hathaways", "The Thundermans", "Nicky, Ricky, Dicky & Dawn" and "See Dad Run" every weekday between 2:00pm and 5:00pm, plus catch brand-new episodes of "Nicky, Ricky, Dicky & Dawn" every Monday at 4:30pm! Get Spellbound with "Every Witch Way" season three! Nickelodeon UK will start to premiere and show brand-new episodes from the all-new third season of "Every Witch Way", beginning with the season opener, "Beachside 7", weekdays at 6:00pm from Monday 30th March 2015, as part of Easter on Nickelodeon UK! It's SpongeBob's Big Squeeze! This Easter, NickToons is squeezing in a much SpongeBob as possible, with three whole weeks of back-to-back episodes! Absorb every moment, soak up all the specials, including "Legends of Bikini Bottom", "SpongeBob's Last Stand" and "Pest of the West", and splash out with more brand-new episodes! Catch "SpongeBob's Big Squeeze", everyday between 10:00am and 3:00pm, only on NickToons! 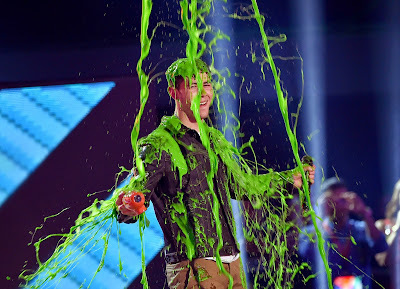 Host Nick Jonas gets slimmed during the Nickelodeon 2015 Kids' Choice Awards. Photo: Kevin Winter/Getty/Nickelodeon©2015 Viacom International, Inc. All Rights Reserved. London, 29th March 2015 6:40pm – Global pop phenomenon, One Direction and the group's legions of fans were recognised at 28th Annual Nickelodeon's Kids' Choice Awards. The group took home two blimps, winning Favourite Music Group in the international vote as well as UK Favourite Music Act. Devoted fans of the group, the Directioners, were also recognised as they won UK Favourite Fan Family. Other UK winners at this year's Kids' Choice Awards included Rixton (UK Favourite Breakthrough) and Alexis Sánchez (UK Favourite Football Star). Zoella (Zoe Sugg) repeated her victory of last year, winning UK Favourite Vlogger for the second year in a row. In the new categories for the year, The Diamond Mine Cart, took the blimp for UK Favourite Tipster while pet of Joey Essex, Prince Essex, proved himself 'the cat's meow,' by being voted UK Favourite Celebrity Animal. Recognising their outstanding contribution to entertainment, Ant and Dec were awarded the honorary UK TV Legends Award. Fans that missed the premiere broadcast of the Awards this evening will have another chance to catch the slime and star-filled Awards Show when it encores at 6:30pm on Monday, 30th March. The Awards will air through the week on Nickelodeon and, for the very first time, on Channel 5 on Sunday, 5th April. Hosted by recording artist/actor and kids' pick for Favourite Male Singer Nick Jonas, the awards were broadcast from Los Angeles' legendary "Fabulous" Forum, where kids celebrated their favourites from the worlds of film, music, television and more. Kids from around the world cast more than 500 million votes, a record-breaking tally. Multi-talented host Jonas opened the show with a stunning performance of his Billboard Top 10 smash, "Chains" and radio hit, "Jealous." Backed by tween-metal trio Unlocking the Truth, his theatrical set also featured a celeb-filled video montage, 3D elements and aerialists. Hip-hop phenomenon Iggy Azalea was joined by Academy Award- and Grammy-winner Jennifer Hudson onstage in a bold and dynamic rendition of their hit "Trouble." In the epic Awards finale, Aussie pop-rock band 5 Seconds of Summer's powerful performance of "What I Like About You" literally blew out the slime-filled speakers, flooding the stage with thousands of gallons of slime. This year's Kids' Choice Awards proved to be as messy as ever: from Diversity being caught in a slime shower in the Awards introduction to Jennifer Lopez presenting Jonas with his award and a surprise sliming. 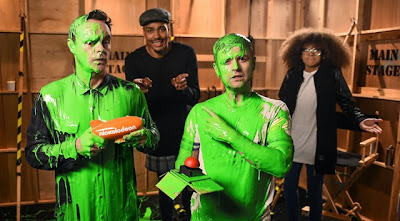 Backstage Chris Pratt and the cast of Nickelodeon show Henry Danger took each other on in a pie fight, while Ant and Dec were coated in the green goo by UK hosts Jordan Banjo and Perri Kiely presented them with Nickelodeon's first ever Kids' Choice Award UK TV Legends honorary Award. The star-studded telecast featured additional celebrity participants, including: Jamie Foxx, Emma Stone, Liam Hemsworth, Chris Rock, Zendaya, Debby Ryan, Chloe Bennet, Fifth Harmony, Joe Jonas, Nick Cannon, Shawn Mendes, Kaley Cuoco-Sweeting, Kevin James, Mo'ne Davis, Skylar Diggins, Ross Lynch, Quvenzhané Wallis, Meghan Trainor, Jennette McCurdy plus cast members from The Haunted Hathaways, SpongeBob SquarePants, and many others. Kids and families paid tribute to their favourites by casting across seven UK specific and additional international categories online, on The Nick App and via Twitter using the hashtag #KCA. Fans can catch up on all of the gossip from the slime-fest by going to kca.nick.co.uk, the official destination for everything Kids' Choice Awards, with hilarious videos, photo galleries, games and all of the latest KCA news on this year's show. The 2015 Nickelodeon's Kids' Choice Awards will be seen in more than 431 million households in 160 countries and territories around the globe. Within hours of airing live in the United States, Canada and Australia, the show will roll out in internationally giving kids around the world the opportunity to tune into their local Nickelodeon channel to enjoy the show. Voting for the 2015 KCAs spanned six continents across 19 localised voting sites, in addition to Twitter hashtag voting (#KCA), giving kids practically everywhere the chance to decide who takes home a coveted blimp. The presenting international sponsors of the 2015 Nickelodeon's Kids' Choice Awards are Heelys, Why Walk? and Dreamworks' comedy movie, HOME. The UK sponsor is Nickelodeon Land at Blackpool Pleasure Beach. Nickelodeon's Kids' Choice Awards is produced by Nickelodeon Productions. Jay Schmalholz, Shelly Sumpter Gillyard, Andrew Llinares and Paula Kaplan are executive producers. Ben Thursby is co-executive producer. Available in 13 million homes, Nickelodeon is the place where kids rule and features top shows such as Nickelodeon's Kids' Choice Awards, The Haunted Hathaways, The Thundermans, SpongeBob SquarePants and Sam & Cat. Launched in 1993, Nickelodeon brings hit international and locally-produced entertainment content to audiences in the UK and Ireland. Viewers can also watch Nickelodeon in high definition through Nickelodeon HD and have the opportunity to catch up with the schedule through Nickelodeon +1. Exclusive games, behind the scenes clips, show information and more are available on nick.co.uk and the dedicated Nick app where viewers can find exclusive content updated daily. Viewers can watch Nickelodeon on Sky, Virgin, TalkTalk, BT Vision, YouView, VUTV on Freeview and on UPC in the Republic of Ireland. The Nickelodeon Network brings the best in kids' content to the UK and Ireland with Nickelodeon channels available in 13 million cable and satellite homes. Having launched in 1993 Nickelodeon UK comprises seven dedicated entertainment channels for kids aged 4-15 and their families, and is a joint venture between Viacom International Media Networks and BSkyB. Angelina Jolie Pitt, Liam Hemsworth, Emma Stone, Jennifer Lawrence, One Direction, Selena Gomez, "SpongeBob SquarePants", Fifth Harmony, "The Voice", "Austin & Ally" and More Win Top Honors at "Nickelodeon's 28th Annual Kids' Choice Awards"
LOS ANGELES--(BUSINESS WIRE)--Angelina Jolie Pitt, Liam Hemsworth, Emma Stone, Jennifer Lawrence, One Direction, Selena Gomez, SpongeBob SquarePants, Fifth Harmony, The Voice and Austin & Ally were among this year's fan favorites, winning orange blimps at Nickelodeon's 28th Annual Kids' Choice Awards, Saturday, March 28, 8-9:30 p.m. (ET/tape delayed for West Coast). Hosted by recording artist/actor and kids' pick for Favorite Male Singer Nick Jonas, the awards were broadcast from Los Angeles' legendary "Fabulous" Forum, where kids celebrated their favorites from the worlds of film, music, television and more. Kids from around the world cast more than 500 million votes, a record-breaking tally. Multi-talented host Jonas opened the show with a stunning performance of his Billboard Top 10 smash, "Chains," and number-one radio hit, "Jealous." Backed by tween metal trio Unlocking the Truth, his theatrical set also featured a celeb-filled video montage, 3D elements and aerialists. Hip-hop phenomenon Iggy Azalea was joined by Academy Award- and Grammy-winner Jennifer Hudson onstage in a bold and dynamic rendition of their hit "Trouble," which continued the storyline of their popular music video. In an epic finale, Aussie pop-rock band 5 Seconds of Summer's powerful performance of "What I Like About You" literally blew out the slime-filled speakers, flooding the stage with thousands of gallons of slime. This year's Kids' Choice Awards proved to be as messy as ever, from Jennifer Lopez presenting Jonas with his award and a surprise sliming; to the Favorite Family TV Show stars of Modern Family getting doused in goo; Jonas chugging a mug of slime in a "Dare or Dare" slime challenge; and a backstage pie fight between Chris Pratt and the cast of Henry Danger. Kids and families paid tribute to their favorites by casting votes in 21 categories, from Feb. 20-March 28, including the newly introduced Favorite Talent Competition Show, Favorite Family TV Show, Most Addicting Game and Favorite New Artist. Fans were able to vote for their favorites across all of Nickelodeon's digital platforms including Nick.com; the Nick App on Android, iOS and Kindle; and through Twitter using #KCA. The star-studded telecast featured additional celebrity participants, including: Jamie Foxx, Emma Stone, Liam Hemsworth, Chris Rock, Zendaya, Echosmith, Josh Gad, Tia Mowry-Hardrict, Grant Gustin, Debby Ryan, Chloe Bennet, Fifth Harmony, Joe Jonas, Nick Cannon, Shawn Mendes, Kaley Cuoco-Sweeting, Kevin James, Mo'ne Davis, Skylar Diggins, Ross Lynch, Quvenzhané Wallis, Meghan Trainor, Jennette McCurdy, Laura Marano, Katherine Herzer, Jennette McCurdy and Bethany Mota, plus cast members from The Haunted Hathaways, Instant Mom, SpongeBob SquarePants, and many others. Nickelodeon upped the digital presence during the 28th Annual Kids' Choice Awards, offering cross-platform interactive experiences before, during and after the big show on Nickelodeon websites, Twitter, Facebook, and mobile and iOS devices. This year's ceremony brought together the on-air and online experience closer than ever before with a live stream of the broadcast, allowing kids and families everywhere to be a part of the night's festivities. Additionally, Nick Digital platforms offered exclusive real-time updates and photos from the carpet and backstage. Users were also able to participate in this year's live vote to determine which Nick cast would go through the first-ever human slime car wash! Fans can relive their favorite show moments by watching video highlights from the live show and flipping through orange carpet, live event and performance photo recaps. The app and website feature clips and photos from past Nickelodeon Kids' Choice Awards shows, along with promotional spots, original video, information about Nick Jonas, nominees, quizzes, and a KCA-themed game. The live broadcast of Nickelodeon's 28th Annual Kids' Choice Awards encores Saturday, March 28, at 10 p.m. (ET/PT) on Nick at Nite, and Sunday, March 29, at 12 p.m. (ET/PT) on Nickelodeon. Replays of the awards will also air on CMT Sunday, March 29, at 3 p.m. (ET/PT); Nicktoons on March 30, at 8:30 p.m. (ET/PT); and TeenNick on Thursday, April 2, at 8:30 p.m. (ET/PT). Nickelodeon's 28th Annual Kids' Choice Awards will be available on Nickelodeon On Demand, Nick App and Nick.com beginning Sunday, March 29. Presenting sponsors of Nickelodeon's 28th Annual Kids' Choice Awards are Amazon Fire HD Kids Edition, General Mills Cinnamon Toast Crunch™, Gogurt® & Fruit Snacks, Hasbro DohVinci, and Walmart. Associate sponsors are Bounty®, Capri Sun, McDonald's®, Nintendo and Toyota. The 2015 Nickelodeon's Kids' Choice Awards will be seen in more than 431 million households in 160 countries and territories around the globe. Within hours of airing live in the United States, Canada and Australia, the show will roll out in internationally giving kids around the world the opportunity to tune into their local Nickelodeon channel to enjoy the show. In many international markets, the 2015 KCAs will feature country-specific award categories and nominees such as Lieblings-Videoblogger: Deutschland, Österreich, Schweiz (Favorite Videoblogger: Germany, Austria, Switzerland) and Artista Brasileiro Favorito (Favorite Brazilian Artist). Voting for the 2015 KCAs spanned six continents across 19 localized voting sites, in addition to Twitter hashtag voting (#KCA), giving kids practically everywhere the chance to decide who takes home a coveted blimp. Nickelodeon's 28th Annual Kids' Choice Awards is produced by Nickelodeon Productions. Jay Schmalholz, Shelly Sumpter Gillyard, Andrew Llinares and Paula Kaplan are executive producers. Ben Thursby is co-executive producer. Media outlets can access information for Nickelodeon's 28th Annual Kids' Choice Awards by logging onto NickKCApress.com. The slimiest event of the year, the Nickelodeon 2015 Kids' Choice Awards, is finally here in the UK! During the event, I'll be posting the UK winners of Nickelodeon's 28th Annual Kids' Choice Awards, hosted by the multi-talented singer/songwriter and actor Nick Jonas, as they are announced right here on NickALive! Keep refreshing the page to make sure your up-to-date with who's won which award at the 2015 KCAs! You can find a list of winners of the worldwide version of the Nickelodeon 2015 KCA's here on NickALive! The main Nickelodeon's 28th Annual Kids' Choice Awards ceremony starts on Nick UK at 5:30pm! Note - This NickALive! blog post contains spoilers about the Nickelodeon 2015 Kids' Choice Awards that some NickALive! readers may prefer to avoid. Please scroll down the page if you wish to continue. Who will win Nickelodeon UK's Favourite Music Act, Favourite Breakthrough, Favourite Celebrity Animal, Favourite Football Star, Favourite Tipster, Favourite Fan Family and Favourite Vlogger blimp awards? And who will get slimed? It's time to find out! Rixton - #VoteRixtonUK #KCA - Introduced by Jack Griffo and Kira Kosarin from "The Thundermans"
Jace Norman and Cooper Barnes introduced the UK TV Legends award, won by Anthony McPartlin and Declan Donnelly! Catch the UK and Irish premiere of the Nickelodeon 2015 Kids' Choice Awards today from 5pm, only on Nickelodeon UK and Ireland/HD!! The stage is set, the slime is ready, and the orange carpet has been rolled out! The slimiest event of the year, the Nickelodeon 2015 Kids' Choice Awards, is finally here! During the event, I'll be posting the winners of Nickelodeon's 28th Annual Kids' Choice Awards, hosted by the multi-talented singer/songwriter and actor Nick Jonas, as they are announced here on NickALive! Keep refreshing the page to make sure your up-to-date with who's won which blimp award at the 2015 KCAs! Bring on the slime! UPDATE - KCA is sadly over for another year. Roll on Kids' Choice Sports 2015 and the Nickelodeon Kids' Choice Awards 2016 (Nickelodeon's 29th Annual Kids' Choice Awards)! Nick Jonas performs the opening song of Kids' Choice Awards 2015! The cast of Modern Family have received the first sliming of the night! Grant Gustin and Chloe Bennet presented Fifth Harmony with their Kids' Choice Award! Jennifer Lawrence slimes host Nick Jonas! Jennette McCurdy appeared at Kids' Choice Awards 2015! Jace Norman and the "Henry Danger" crew just demolished Chris Pratt in a little old fashioned pie fight! The 2015 Nickelodeon Kids' Choice Awards are almost here, which means it's time to unroll the Orange Carpet, polish the Blimps and get that slime flowing! In celebration of the greatest, wildest and slimiest show on earth, Kids Choice Awards 2015, this edition of NickALive! 's Nickelodeon News Round-Up is dedicated to all things KCA 2015! Below is a round-up of the latest Nickelodeon Kids' Choice Awards 2015 news, gossip and videos! Nickelodeon UK has announced the very exciting KCA news in a Tweet on their official Twitter profile page, @NickelodeonUK, that, to celebrate Nickelodeon's Kids' Choice Awards 2015, "UK: Favourite Breakthrough" KCA 2015 nominees Ella Eyre and Ella Henderson will be performing during Nickelodeon UK's "Kids' Choice Awards 2015" pre-show special, "Kids' Choice Countdown 2015"! Presented by UK hosts Jordan Banjo and Perri Kiely, viewers in the UK and Ireland can watch Nick's "Kids' Choice Countdown 2015", which will feature the latest behind-the-scenes action, Orange Carpet gossip, and Jordan and Perri sliming their Diversity co-dancers, on Sunday 29th March 2015 from 5:00pm on Nickelodeon UK and Ireland and Nickelodeon HD UK, followed by the main show, the 2015 Kids' Choice Awards, hosted by the multi-talented singer/songwriter and actor Nick Jonas, at 5:30pm! The Nickelodeon Kids' Choice Awards is right around the corner, and the 28th annual slime-fest is set to be bigger than ever. For the first time, the show will be simulcast across Viacom properties Nickelodeon, TeenNick, Nicktoons and TV Land, in addition to live streaming on Nick.com and the Nick App. Following the live show, encores will air across said cable nets, and CMT. "At Nickelodeon, we are really in touch with kids and this show always reflects what's going on in their lives," exec producer Jay Schmalholz tells Variety. "Having fun, making kid's laugh, staying relevant and, of course, slime" are all key components that make Kids' Choice a success year-to-year. Hosted by Nick Jonas from the Forum in Inglewood, California, the KCAs will welcome the likes of Emma Stone, Jamie Foxx, Liam Hemsworth, Grant Gustin, Nick Cannon, Josh Gad, Kaley Cuoco-Sweeting and YouTuber Bethany Mota, plus tween fan-favorites including Laura Marano, Ross Lynch, Debby Ryan, Shawn Mendes and Zendaya. "I'm really excited to see Jamie Foxx, Chris Pratt and some surprise guests I can't mention," Jonas tells Variety. Jonas also revealed that as emcee, he gets special privileges. "As the host, I also got to send the show my wish list of celebrity slimings," he teased. "You'll have to tune in to see who it will be." Pulling double duty, the singer will open the show with a medley performance of his double platinum smash hit "Jealous" and "Chains." Australian rock band 5 Seconds of Summer is also set to take the stage, along with Iggy Azalea and Jennifer Hudson who will play their duet "Trouble" together. What makes you the perfect Kids' Choice Awards host? Jonas: "I grew up watching Nickelodeon and in addition to winning a couple of blimps, I had the opportunity to perform on the show while with the Jonas Brothers. I've always dreamed of hosting the show and am really excited. It will be fun." Did you watch the KCAs when you were a kid? Jonas: "Of course! I loved watching all of the performances, but I think my favorite part was seeing the celebrity slimings." How are prepping for the big show? Jonas: "I've been watching videos of previous hosts, focusing and visualizing success." Schmalholz: "It's always hard to top yourself. But this year, we're in the biggest venue we've ever been in, so by scream volume alone, we've already topped ourselves. Our host Nick Jonas is incredibly relevant right now. He connects with kids everywhere because he's a kid himself." What is different about the show this year? Schmalholz: "We're incorporating our Nickelodeon stars more than ever this year. You will see cast members from 'Bella and the Bulldogs,' 'Henry Danger,' 'Nicky, Ricky, Dicky & Dawn' and 'The Thundermans' to name a few. This year we built the first-ever human slime car wash for the winner of our live voting category, and created a dancing archway of slime for our winners to walk through prior to accepting their award." Do you have any surprises up your sleeves? Jonas: "I can't give away any surprises — where's the fun in that?!" Schmalholz: "Yes, but if I told you they wouldn't be surprises! What I can tell you is that we will have some unannounced special celebrity appearances and sliming spectacles that will have to be seen to believe. Also, we're using a 3D mapping technology to create multiple and unique environments in the house." Why do celebrities love the Kids' Choice Awards? Schmalholz: "Celebrities are always looking to connect with their audience and there's no better place than Nickelodeon for them to do that. This show is a lot of fun and winning a blimp and getting slimed is the ultimate honor in Hollywood…every A-list celebrity in Hollywood has either asked to be slimed or is waiting to be slimed." Jonas: "Yes! To be slimed has often been described as "the ultimate honor" and who wouldn't want to be honored?" How much slime should we expect? Schmalholz: "Slime is always the star of the Kids' Choice Awards, and this year we are truly infusing it in every aspect of the show…For our finale, we will be using more slime than ever with 5 Second of Summer. Let's just say, it will be a slime finale of epic proportions." Nickelodeon's Kids' Choice Awards air Saturday, March 28 at 8:00 p.m.
Meet The Stars Of Nickelodeon's "School Of Rock"
Nickelodeon France Premieres "Henry Danger"